Music Costs > How Much Does a Mariachi Band Cost? Arriving in the music world in the late 19th century, mariachi bands bring about a traditional yet upbeat sound to Mexican culture. With a blend of trumpets, guitars, violins, the vihuela and the guitarron (a large acoustic bass), an authentic mariachi band will be able to play several instruments and sing as well. Dressing in typical Mexican costumes and wide-brimmed sombreros, these traditional street musicians can now be found at birthdays, a wedding, quinceañera, anniversary parties and more. The cost of hiring a mariachi band, as with any professional performer, will greatly depend on the performer’s experience, your geographical location, how far they need to travel, how long they need to play and how many members are in the band. 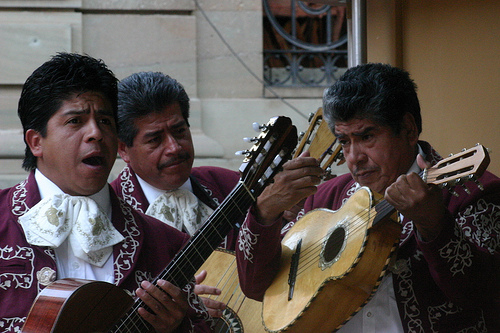 A mariachi band can vary in size, with some as small as three while others can have as many as 12+. Typically, a mariachi band, even if it is larger than average, will be able to tailor their size to accommodate the event. From what we researched, we found that most bands charged anywhere from $375 to $625 an hour for the entire band, with most bands including three to seven members. Many of these bands, from what we researched, would require a two to three-hour minimum before confirming the booking. Members on this WeddingBee.com forum thread talked about what they had paid to rent a mariachi band, and according to the responses, prices ranged anywhere from $800 for three hours to an average of $350 an hour. Playing around with this ThumbTack.com calculator, the average expected price across the United States was anywhere from $700 to $3,000+ to hire a basic mariachi band with more than four people for any event. In some circumstances, additional sound equipment, if needed, could be an additional charge. Most bands are willing to travel a certain amount of miles for free; however, after they travel past this set amount of miles, travel surcharges, and if necessary, hotel accommodations may be billed. Tips are highly recommended and will not be part of most quotes. Most mariachi bands will have an online profile, either via Facebook, on booking websites, YouTube and/or they may have their own personal band website. If possible, listen to the samples and watch the video of any of their live performances if they are available. If possible, look for reviews online as well to see what other people said about them in the past. When hiring, see what they need in regards to a setup requirement, the type of songs they plan on playing, the availability and get as many specifics as possibles to receive the most accurate customized quote possible. AliveNetwork.com recommends looking for a great demo CD, great photos, customer reviews, what equipment they plan on using, their experience and how reliable their booking agency is if they use one. To find a mariachi band for hire, we recommend either ThumbTack.com, GigSalad.com or GigMasters.com.